A furnace in which volumes of air are supplied from below the fuel bed or supply. (for heat treatment), a furnace for the treatment of long articles in a vertical position or of metal strips moving vertically. Updraft furnaces, which vary in design, are widely used in the metallurgical and machine-building industries. Two types of updraft furnace are distinguished: batch-type furnaces, with periodic loading of the products; and continuous-operation furnaces. Furnaces of the first type, of which the most commonly used are shaft furnaces, operate with normal oxidizing heating (without muffle) or with the use of shielded atmospheres that protect the products from oxidation (muffled furnaces). Shaft furnaces are used for hardening and drawing gun barrels, shafts, turbine rotors, and other types of long articles. The articles are heated up by gas or electric current. Intense circulation of gas combustion products or the shielded atmosphere speeds up the heating process. Circulation of the shielded atmosphere in furnaces is provided by blowers. Furnaces are built up to a height of 30 m, with a working space 3-4 m in diameter. Continuous-operation updraft furnaces (in which a strip undergoing heat treatment moves continuously through the furnace) are subdivided into single-conveyer or multiconveyer types. 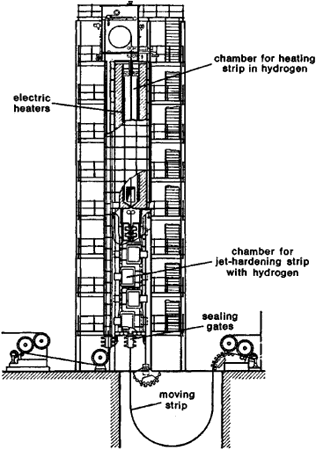 In single-conveyer updraft furnaces the strip undergoes heat treatment in one operation, moving from top to bottom or from bottom to top (for example, furnaces for bright hardening of stainless strips in hydrogen—see Figure 1). Figure 1. Updraft furnace for bright hardening of a stainless strip in hydrogen. In multiconveyer furnaces the strip is subjected to heat treatment through a series of up to 40 vertical conveyers (continuous sheet-metal annealing). Updraft furnaces of this type treat cold-rolled strips for various purposes (sheet metal, transformer steel, generator steel, stainless steel, and others). Nonoxidizing annealing, with retention of the strip’s bright surface or in combination with chemical heat treatment (decarbonization of transformer steel), is performed most frequently in these furnaces. The metal is heated by gas, which is burned off in radiation pipes, or by electric current. Jet cooling of the strip by shielding gas (nitrogen) or hydrogen is used to shorten the length of the strip in the furnace or the height of the furnace. Radiant panel burners, which accelerate the heating, are used in continuous-operation furnaces with normal oxidizing heating of the strip. The furnaces are set up in continuous strip annealing units, which also include equipment for cleaning the strip, roll winding and unwinding of the strip, and so on. These furnaces range from 20 to 30 m in height and handle strips up to 800 m long at running speeds of up to 10 m/sec. The units are completely mechanized, and their processes are automated by control computers. Continuous-operation updraft furnaces are widely used in the iron and steel industry for the production of cold-rolled strips and sheets. Metallurgicheskie pechi, 2nd ed., part 2. Moscow, 1964. Efros, M. M. Nagrevatel’nye i termicheskie pechi na gazovom top-live. Moscow, 1965.